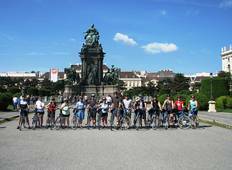 Find a Bicycle trip that explores Central Europe. There are 138 tours to choose from, that range in length from 3 days up to 16 days. The most popular month for these tours is June, which has the most tour departures. "Well organized, excellent group leaders. Some confusion communicating between Tour..."
"This was an amazing experience. 8 of us from Arizona and California decided to celebrate..."
"Everything about our trip was fantastic. Tom arrived right on time and was completely..."
"An excellent gentle cycle from Prague to Dresden. The first night is in a beautiful..."
"It was a well-designed tour - at times it may seem a bit more difficult than expected..."
"Happy with Pure Adventures. Not happy with Helia (the local trip company)." "We had a great holiday with Meridien Ten, and were very, very impressed with the..."
"This was a great tour. It was a little different than what I had expected in that..."
"This was my first ever cycling holiday and it was fantastic. Without much training..."
"Incredible attention to detail and service. I've done tours with other companies..."